The final chapter in the 21-year history of NASCAR’s AutoZone Elite Division Southwest Series at Stockton 99 Speedway was etched into the record books on Saturday as series veteran M.K. Kanke, of Frazier Park, t riumphed in the 15th Annual AutoZone 100. Sitting behind Modesto’s #6, Jeff Belletto on the 22-car starting grid, #33 Kanke inherited the race lead on lap three after Belletto was forced to serve a pit drive through penalty when officials black flagged him for jumping the start. Kanke would never relinquish the top spot during the next 102 laps to earn his second win of the 2006 season and 22nd of his career, a new series record. "Breaking the record was pretty important to me, especially doing it here at Stockton," said the jubilant Kanke, who tied Rick Carelli’s Southwest Series record of 21 victories just two weeks ago at Altamont Motorsports Park. "I think I have finished second here three times, so this was nice." After qualifying second to series points leader #12, Rip Michels, of San Fernando, local favorite #62, Eric Holmes of Escalon, started the race from the seventh position after an invert of eight was drawn. As the race progressed, Holmes, (right), steadily worked his way through the field, taking second place from Prunedale’s #03, Jim Pettit II on lap 70, but he was unable to close ground on Kanke. Holmes was given one last opportunity for victory when the fourth and final caution flag of the night came out on lap 94, causing the race to go to a green-white-checker finish five laps beyond its scheduled 100 lap distance. Although he stayed glued to Kanke’s bumper on the restart, Holmes was never able to get into position to execute a pass and was forced to settle for second. "I was good for the first couple of laps on the restarts all night so I thought I had a chance to get him at the end, but he brake checked me and held me up a little. He did what he had to do," said Holmes, who desperately wanted to win the final Southwest Series event on his home track. "I respect Kanke a ton. I would have roughed him up a little bit to win, but I would never take him out." Eddy McKean, #19, of Jerome, Idaho, finished the race in third, Michels fourth, Napa’s #92, Joey Zampa turned in a solid performance for fifth and Modesto’s #30, Steve Belletto was able to overcome a tire stagger problem in qualifying, that relegated him to 14th on the starting grid, to take a hard earned sixth. It was all Pete and re-Pete in round #7 of the special HOTWOOD 1000 Series, by JM Environmental, for the Havoline Western Late Models. Overcoming the frustration of last weeks DNF and a case of the flu, defending track champion Pete Anderson Jr., of Stockton, jumped into the lead on the opening lap and stayed there the rest of the way, fighting off numerous challenges of a very determined #20, Pete Hernandez of Chicago, Illinois. Nobody else in the 19-car field could touch them as the two waged their personal battle throughout the entire 100-lap distance of the race. "The car was good for the first 60 laps and then it started to get really loose. I thought he might get me one time near the end, but I drove the car hard into the turn and luckily it stuck," said an exhausted Anderson. "After last week, we really needed this tonight." Although disappointed to finish second, Hernandez was pleased to get a top finish after suffering through his own recent DNF blues, in which he was forced to the pits prematurely in three of his last four starts. "We had a fast car, but every time I got a run on him going, he would get a good run also. I put some heat on him and I really wanted to pass him, but only if I could do it clean," said Hernandez. "It was a good night. This gets our program back on track and we put on a good show for the fans." Salida’s "Slammin" Sam Solari finished the race in third, 20-year-old boy wonder#15, Mark Holeman of Los Altos turned in another solid performance for fourth, Chowchilla’s Eric Humphries took fifth and pre race series points leader Guy Guibor, of Manteca, was forced to settle for sixth. Sticking to the night’s theme of getting to the front quickly and staying there, pole-sitter #6, Mark Henslee, of Lathrop, cruised to his fourth win of the season in the Pro-4 Truck feature. Ron Robeck of Milpitas, finished second and Mike Curry, of Stockton, completed the podium. "My truck was getting pretty loose and I honestly thought Robeck was going to get me, so it feels pretty good to win tonight," said Henslee, who also captured the dash and earned the top spot in qualifying for a clean sweep of the evening’s truck activities. Hometown racer #99, Donny Darter was going for his third straight sweep in the always unpredictable American Limited Stock Car (ALSC) division. Darter accomplished the first two legs by topping qualifying and wining the dash, but he had his work cut out in the 30-lap ALSC feature when the pre race invert draw came up a 12. Starting along side of ALSC season points leader #75, Chad "the Iceman" Holman in row six, the pair worked their way to the front of the 21-car field by mid race. Darter looked to be poised to take the lead from Holman when a wreck on the front straight suddenly brought out a checkered yellow due to time limitations after only 19 laps. "I saw Darter and I tried to just stay focused. It was a hard fought race tonight, especially coming from eleventh," said Holman, of Stockton. "They cut it short and a lot of the drivers aren’t happy, but they gave us a time limit, so that is just the way it goes, I guess." 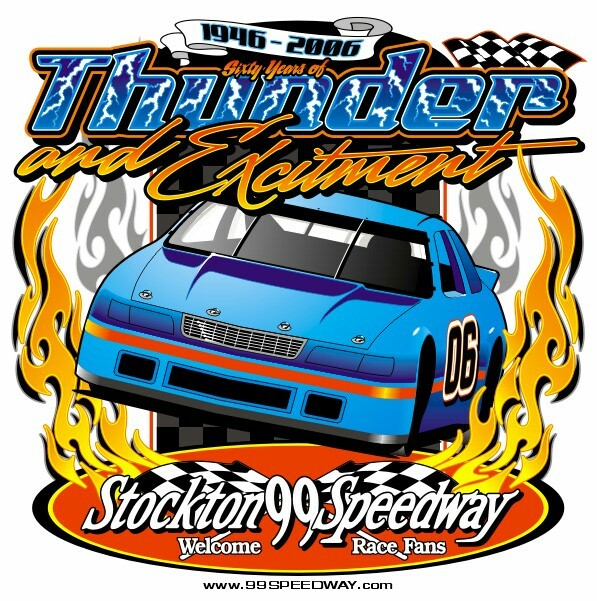 The Stockton 99 Speedway will return to action next Saturday night, July 22, with a big six division program that includes the NASCAR Dodge Weekly Racing Series Western Late Models, Grand American Modifieds and American Limited Stock Cars, presented by Havoline/C.L. Bryant, plus the Legends, Baby Grands and Northern California Modified Association Sprints.